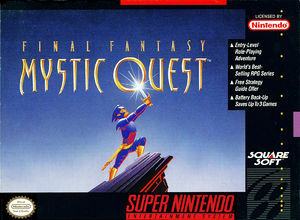 Final Fantasy Mystic Quest, released as Mystic Quest Legend in PAL regions and as Final Fantasy USA: Mystic Quest (ファイナルファンタジーUSA ミスティッククエスト Fainaru Fantajī Yū Esu Ē Misutikku Kuesuto) in Japan, is a role-playing video game for the Super Nintendo Entertainment System. The game was released as a spin-off to Square's popular Final Fantasy series of video games. The events of Final Fantasy Mystic Quest take place on a single continent, which is divided into four distinct regions: Foresta, Aquaria, Fireburg, and Windia. The welfare of each region is determined by the state of one of four shining crystals: earth, water, fire, and wind. For centuries the Focus Tower had stood at the heart of the world as a center for trade and knowledge, and the world's people met there to peacefully settle their differences. But on one warm summer day, powerful monsters stormed the Tower, stole the four crystals, and then took off with the magical coins that kept the Tower's doors unlocked. The monsters began consuming the power of the crystals; they grew in strength while the world began to decay. An old prophecy tells that at the time the "vile four" steal the power and divide the world behind four doors, a knight will appear to vanquish the darkness. The graph below charts the compatibility with Final Fantasy Mystic Quest since Dolphin's 2.0 release, listing revisions only where a compatibility change occurred. This page was last edited on 3 December 2017, at 15:58.